Back in October, I bought this palette for less than 4$ from Rite Aid, and was so impressed with it that I went back a couple days later to buy three more. I'll probably put two of them up to give away on either facebook or twitter, so look out for that soon. Now, click the jump for the review and lots of photos! Despite my bad experience with a different matte nail polish from Zoya, these two colors had surprisingly great wear on my nails. I wanted to post something on time for once and tried a holiday manicure last week with Posh and Veruschka. It's nothing too fancy (and rather boring in my opinion), but I wanted to put up a post in the spirit of Christmas, so here it is! I hope you all are having a wonderful holiday weekend staying cozy and warm with loved ones. If you remember this video from a previous Too Faced review, you might remember seeing this pan of eyeshadow. Similar in size to a single MAC eyeshadow, this Too Faced color is priced at 18$ for 0.06 oz of product and is a lovely purple-blue duochrome. MyGlam is the first makeup-related subscription I've signed up for and it just started up this month. I'm not too sure how other subscription boxes work, but MyGlam bags are 10$ a month (with free shipping) and sent out to subscribers towards the end of a given month. I received mine on Tuesday, the 13th, but I did hear about people getting theirs the day before. The other day, I was sent this photo and it got me thinking about how long I've been blogging on here. I actually started out on tumblr because it had been a familiar platform for a few years already. Then the tumblr 'blackout' happened and I deemed it unreliable to store my documenting. I also wanted my own domain since I was progressively getting more into makeup and thought that maintaining a blog would encourage me to be more organized. I have the memory of a goldfish, so the cataloging on here has really helped me at times. Also, I admit, I used to hate on twitter, and avoided making an account for so long. But now it's my go-to for social networking and keeping up with new friends and brands. It's an avenue where I've met lovely people who I bond with though I've never even met most of them in person. I understand that a year is not much, but I think I've improved in ways that I hoped I would compared to the initial start of this blog. my photography -- something I aim to continuously better as I get older. my makeup application -- some of my previous posts are soooo embarrassing to look at now. phasing out watermarks -- I've always hated them, but they made me feel more secure about "sharing." It will still bother me a whole lot if I find people stealing my photos (it remains a constant fear), but I try not to think about it because it hinders me. readership -- as much as I'd like to say that it doesn't matter how many people read my blog, it really does affect me sometimes. I just don't seem to have that allure~* of getting more people to stick around constantly, so I really appreciate the readers who take the time to comment every once in a while and interact with me. Thank you for your continued support. consistency, both with posts and videos -- I wish I could just work as a full-time blogger, wouldn't that be a dream? Although I can't fully focus on this blog until sometime next year, I do hope to have some sort of regularity in the future. editing videos -- I have no idea how to edit videos. I just sort of do them in one go which can be quite strenuous if I have to do multiple takes, haha. taking selcas and more FOTDs -- I need to be less camera shy even if my look is a disaster. I definitely want to take 'live and learn' to heart, because at the end of the day, it's just makeup. meet new people (in person) -- I'd really love to meet any of the friends I've made through twitter, attend IMATS in California, and Beautylish events next year. self promotion -- I don't want to come off annoying, so I try not to, but I haven't quite learned the art of confidently promoting oneself. I'd really like to be sponsored for a product (or two) by a brand I love and in general, feel more appreciated by brands I support. side project: slowly build a wardrobe by finding clothes that fit me properly and dress more ladylike! These are just a few things I could think of and wanted to share with you all. I hope to keep improving for not only myself, but for the readers who have stayed by me since finding this modest beauty blog. I am truly grateful to everyone who has stuck around beyond the giveaways, and have even become my friends through the portal of the internet. If you have any suggestions for me to work on or feedback you'd like to give me, please feel free to leave them in the comments or shoot me an email! I am completely untalented at describing scents and deem myself rather useless when it comes to that kind of thing. I can, however, show you product shots! Plus, I really only got this rollerball perfume because of its packaging and for the sake of collecting as many Donutella things as I possibly can. It is 18$ at Sephora. This mini giveaway will probably be the last for 2011. I promise there'll be bigger ones in the coming year! Remember, there's always a giveaway page for future ones you may be interested that is updated periodically. 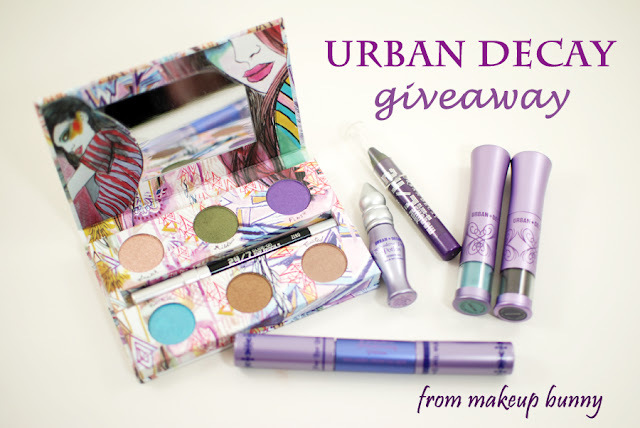 Last month, I won an Urban Decay beauty bundle from Beautylish. Please check out their site if you haven't already. It is a wonderful beauty community filled with reviews, photos, and videos all in one place. The team themselves post helpful tips and inspiration everyday and are very friendly on twitter. I hope someday to finally meet them in person at one of their awesome events! Anyway, I wanted to show you swatches of the goodies I received as I've been wanting to try most of it myself! Hit the jump for a mega photo post. Talk about late--I've had this palette for nearly a year, and I'm now finally reviewing it. I don't love it as much as the Sweet Heart one, but it's a great palette nonetheless. After all this time of trying out a lot different brands, Sugarpill remains as one of my constant favorites. I reach for these colors whether it's for an everyday smokey eye, feeling creative, or for when I'm traveling. The Burning Heart quad has four rainbow-friendly colors that are wonderfully vibrant in their (mostly) matte application. I swatched a few different colors using a new top coat I got from the Old Vic Collection by Nails Inc today! These photos however, are of the manicure I gave myself for the week while I test out the wear. I messed up my ring finger several times before I painted something that didn't look terrible, so I hope you like it~ Look out for the duo polish review early next month! These Cromatico palettes have been out for quite a while now, but before Sephora's Black Friday discount coming up tomorrow where they're 10$ each (limit 2), they were discounted to 19$ down from the original 25$. Unfortunately, as cute as these palettes are, I'm not even sure that they're worth 10$ each. On a side note, I also have one in Bastardino, and really only got these mini palettes because I liked the charms and never bought the respective tokidoki Cactus Pup vinyl figurines. Lust Red is the second Eyes to Kill eyeshadow I have, and it is also my favorite. For a more complete review, please check out my first post on Blast of Blue. IPKN lip glosses can be found for 19$ at Pretty & Cute. I tried the one in Peach, and it is a generous tube of pink tinted gloss. As always, there are more photos and swatches after the cut, but check out the video for an overview and size comparisons! Coquette (29$) is a dusty rose colored lipstick that comes in luxe Lancome packaging. The shiny golden tube goes inside a sleek black lid that's magnetic and the general weight of the lippy does not feel cheap. Halloween in Chicago--I didn't write down everything I used that night, but here's a partial list of what I can remember to the best of my ability. This cute palette from Urban Decay offers three neutral shades with a pop of bright pink. You can get it for as low as 15$ (down from 32$) right now as their Friends & Family sale ends today. I went to Walmart a while back and got excited since it was the first time seeing Hard Candy anywhere. I picked up Supernova (274) to try something from the brand and mildly regret it now. It's unfortunate that it's rather worthless if you'd like to use it dry because it looks so pretty in the pan. Mink Mitten is a color from the new FAiL Collection ManGlaze released about a month ago. It's become my favorite matte nail polish ever, and I don't proclaim that lightly. The label art will be changing from this plastic stickered version I have, so you probably won't be seeing this exact one if you decide to pick it up. And if you're going to shop, don't forget to do it through their facebook for 10% off. Urban Lash falsies from Urban Decay go for 15$ a pair. It's a little pricey, but their lashes are well-made, durable, and come with great lash glue. Other lashes I have include Instaglam Technicolor and HBIC, but I've only tried the latter of those two as of yet. A photograph of my nails wearing OPI colors is featured on the homepage of Beautylish today! Here's is my original post with lots more bokeh goodness. Please check out the other ladies who are featured as well. I recently did a swap with Lippi where I asked for blank Make-Up Studio face charts, but she sent along extra goodies with it! If you'd like to see what I sent her, do check out her post here. This palette is an older release and I haven't seen it around other than on eBay. It comes with six lovely eyeshadow shades from Urban Decay along with a mini eyeliner in Zero and a mini genie bottle of primer.